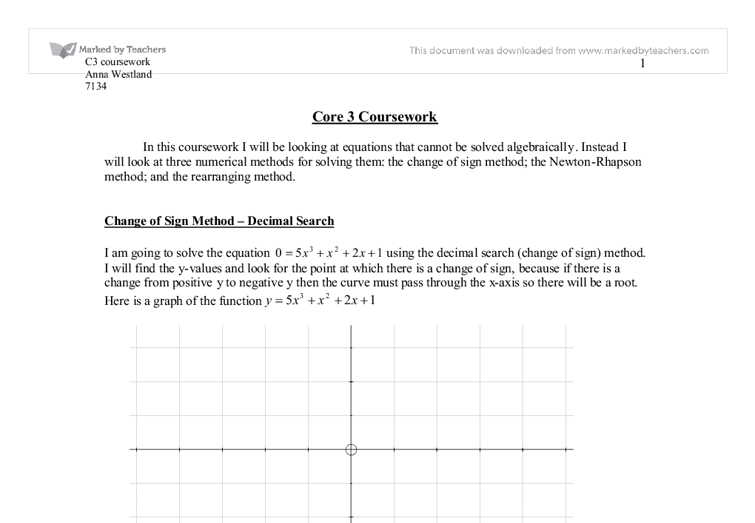 Core 3 Coursework In this coursework I will be looking at equations that cannot be solved algebraically. Instead I will look at three numerical methods for solving them: the change of sign method; the Newton-Rhapson method; and the rearranging method. 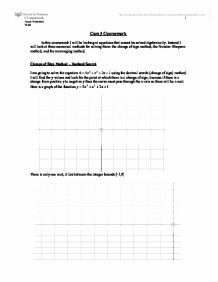 Change of Sign Method - Decimal Search I am going to solve the equation using the decimal search (change of sign) method. I will find the y-values and look for the point at which there is a change of sign, because if there is a change from positive y to negative y then the curve must pass through the x-axis so there will be a root. Here is a graph of the function There is only one root; it lies between the integer bounds [-1,0] I have calculated the corresponding y-value for each x-value within this range, 1 decimal place apart. x y -1.0 -5 -0.9 -3.635 -0.8 -2.52 -0.7 -1.625 -0.6 -0.92 -0.5 -0.375 -0.4 0.04 -0.3 0.355 -0.2 0.6 -0.1 0.805 x y -0.50 -0.375 -0.49 -0.3281 -0.48 -0.2826 -0.47 -0.2382 -0.46 -0.1951 -0.45 -0.1531 -0.44 -0.1123 -0.43 -0.07263 -0.42 -0.03404 -0.41 0.003495 -0.40 0.04 Again the change of sign is highlighted; the root must lie between [-0.42,-0.41], so I will investigate these values. x y -0.420 -0.03404 -0.419 -0.03024 -0.418 -0.02645 -0.417 -0.02267 -0.416 -0.0189 -0.415 -0.01514 -0.414 -0.01139 -0.413 -0.007656 -0.412 -0.003929 -0.411 -0.0002117 -0.410 0.003495 The root ...read more. At the points of intersection between y=x and y=g(x), the value ofis the same as the-value of the root. So the function I draw is As shown by the graph the points of intersection have the same- values as the roots. It is solved by using the following iterative formula The start value is on the, a line is drawn vertically from this toand then back toto give an -value I shall attempt to solve the root that lies between the integer bounds [0,1]. This is also an iterative method; so it can also be found by using the iterative formula e.g. The method continues - as shown on this graph - and the line gets closer to the root. 0 0 1 0.5 2 0.25 3 0.421875 4 0.3081169128 5 0.3868473491 6 0.3334157357 7 0.3703154321 8 0.3450823796 9 0.3624702747 10 0.3505459983 11 0.3587522222 12 0.3531178082 13 0.3569927519 14 0.3543307844 15 0.3561608808 16 0.3549033523 17 0.3557677607 18 0.355173725 19 0.3555820258 20 0.3553014198 21 0.3554942827 22 0.3553617337 23 0.3554528342 24 0.3553902227 25 0.3554332551 26 0.3554036797 27 0.3554240065 28 0.3554100362 29 0.3554196378 30 0.3554130388 31 0.3554175742 32 0.3554144571 33 0.3554165994 34 0.355415127 35 0.355416139 36 0.3554154435 37 0.3554159215 38 0.355415593 39 0.3554158188 40 0.3554156636 41 0.3554157702 42 0.3554156969 43 0.3554157473 44 0.3554157127 45 0.3554157365 46 0.3554157201 47 0.3554157314 48 0.3554157236 49 0.3554157289 50 0.3554157253 51 0.3554157278 52 0.3554157261 53 0.3554157273 54 0.3554157264 55 0.355415727 56 0.3554157266 57 0.3554157269 58 0.3554157267 59 0.3554157268 60 0.3554157267 61 0.3554157268 62 0.3554157268 So the root to 5 d.p. ...read more. Decimal search by hand would simply be putting x-values into the formula, so the tables produced would be exactly the same as those above (these tables can also be immediately produced by graphical calculators); the further down the tables the changes of sign are, the longer the method will take; this method by hand is fairly accurate, as the values do not rely on each other and rounding does not affect the results (as you just need to look for whether the value is positive or negative). Decimal search is the most reliable to do by hand as you will find out immediately if it will fail and mistakes are immediately apparent (the next table will not have a change of sign in it), whereas rearrangement or Newton-Raphson may take many iterations before you realise it is diverging, overflowing or moving towards the wrong root. If using Newton Raphson, I would have to differentiate the function myself. Also, without Autograph, I would just have to start with an equation and would have no graph to look at; so I would not know how many roots there were or where the start values were (this would mean it would take up much more time); when using rearrangement I would not be able to see the gradient of g(x) so I would have no idea if the roots would fail, and I could waste a lot of time. ?? ?? ?? ?? 1 C3 coursework Anna Westland 7134 ...read more. Writing the formula in a cell and dragging it down so it is easier to calculate the y values for various points of x. Using Autograph is much, much simpler as you have the ability to zoom in on the point where the signs change, i.e. So we go across to the line y=x, which reflects this value onto the x-axis, and then down to the curve. This produces the value -3.382999. I then repeated the process, going across to the line and down to the curve each time. In my investigation I will also calculate the resultant velocity, journey time and bearing of travel, for each observation site A - H. I will make separate calculations for the departing and returning journeys, as this will allow me to compare how they are affected by the wind. If the intervals were smaller then it would have worked. Newton Raphson Method In this method an estimate of the route is taken a line equal to x is taken up until it hits the curve and then a tangent is drawn down to the x-axis. make an approximation from Mâ up to Mââ, these algorithms made it much easier and quicker to come to a final answer thanks to the ability to just simply pull down the box with the algorithm in to transfer it to other boxes.